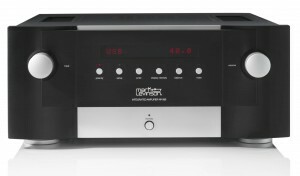 An English language followup, on the Mark Levinson 585 – a new integrated amplifier from Mark Levinson. As I remember it from the recent AudioShow 2014, held in Warsaw as of this last weekend, it was the amplifying component with one of those so-called killer configurations – delivering the highest level of hiend sound quality, that frankly speaking … blew my boots off. And not because of the fact that I was sitting in the front row. Now, indeed, it so happens that I did build some DIY amps in my life. Just as I did prep up and/or build from scratch some speaker cabinets. With which, of course, I am very happy with, these DIY devices, which are currently standing in my living room at home and that provide me regularly with a healthy daily portion of pure listening pleasure. Hmmm …. but to say it quite frankly, I think I have to honestly admit that this DIY kit of mine comes close, albeit not quite, to the sheer clout and realism of the delivery, as I have experienced whilst listening to this killer configuration: a Mark Levinson 585, in conjunction with the JBL Everest, model K2 S9900, which I had the opportunity do experience during a presentation as conducted this past weekend at the Hotel Bristol in Warsaw. The Everest K2 S9900 was specifically a slightly smaller model than those Everests which have been presented last year. Anyway – the sound, for me at least, was just perfect. Precision. Air. Detail. Lung-smashing clout. Imaging. Ambience. Wood sounded like wood. Percussion sounded like a percussion. It was all there. Experienced on a myriad of various quality recordings. That is my personal and subjective feeling. 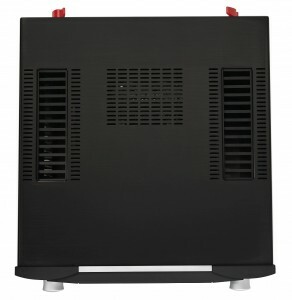 The JBL Everest series speakers – well – these deserve a separate story of sorts, and maybe I will get some info on them, as they were definitely mind blowers. A separate issue, a distinct piece of art, worthy of a separate article. 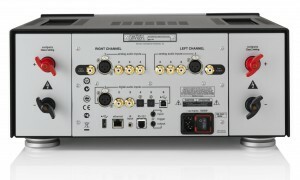 Due to the fact that the configuration presented has played so fantastically and to my liking, I have undertaken a little extra effort and turned (“with some kind of shyness”) to the distributor of these devices with a kind request to provide me with some more information about this particular Levinson, the one that I have experienced during the presentation. Well, yes, indeed, they replied and provided me with quite a substantial package of information relating to the device, so now I would like to share the stuff with you folks. As the information was prepared by professionals, I shall rest my case, I shall not try to fix it, … I shall simply quote extensive fragments of the official press release from Mark Levinson, pertaining to the model 585 integrated amplifier. 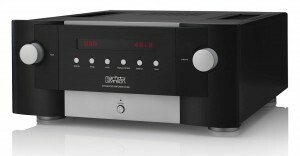 …The (…) Mark Levinson No 585 Integrated Amplifier, is designed to deliver ultimate-quality music reproduction from analog and digital sources, including computers and music servers. 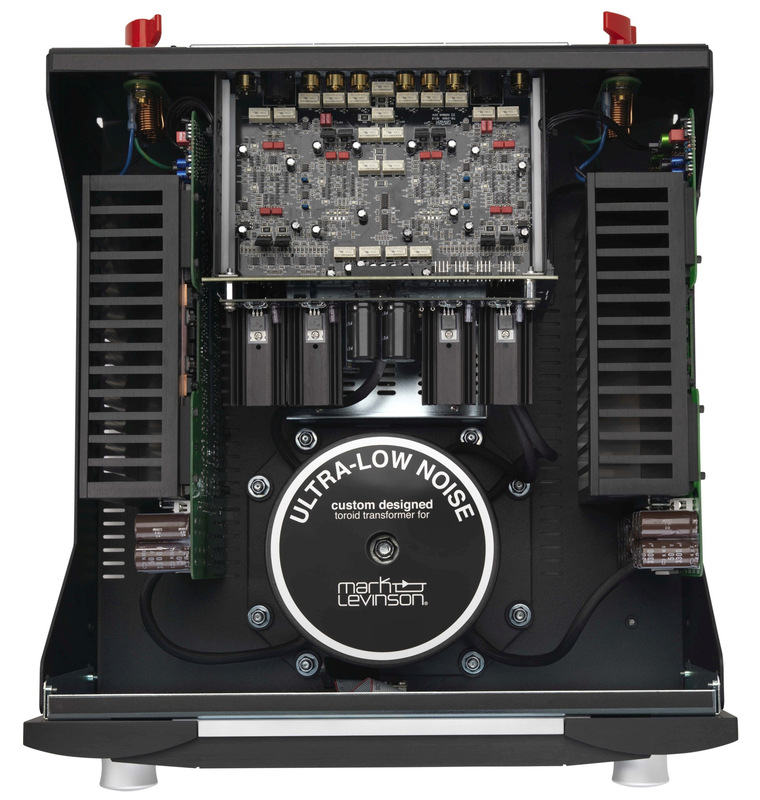 The No 585 offers six digital and four analog inputs including USB, optical, coaxial, AES/EBU XLR and RCA for ultimate flexibility. It employs fully discrete, mirror-imaged, dual-monaural analog input and output circuitry, optimized for sonic integrity as evidenced by its symmetrical, clean interior design. 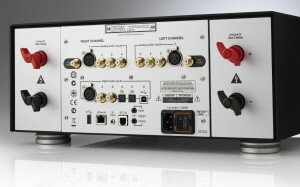 The No 585 uses individual signal switching relays for each of its four analog stereo inputs: one XLR and three RCA. 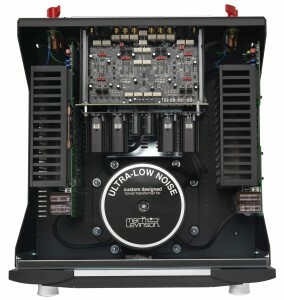 The volume controls use discrete 15-bit R-2R resistor ladder networks and low-noise analog switches for maximum signal integrity with the widest possible bandwidth. 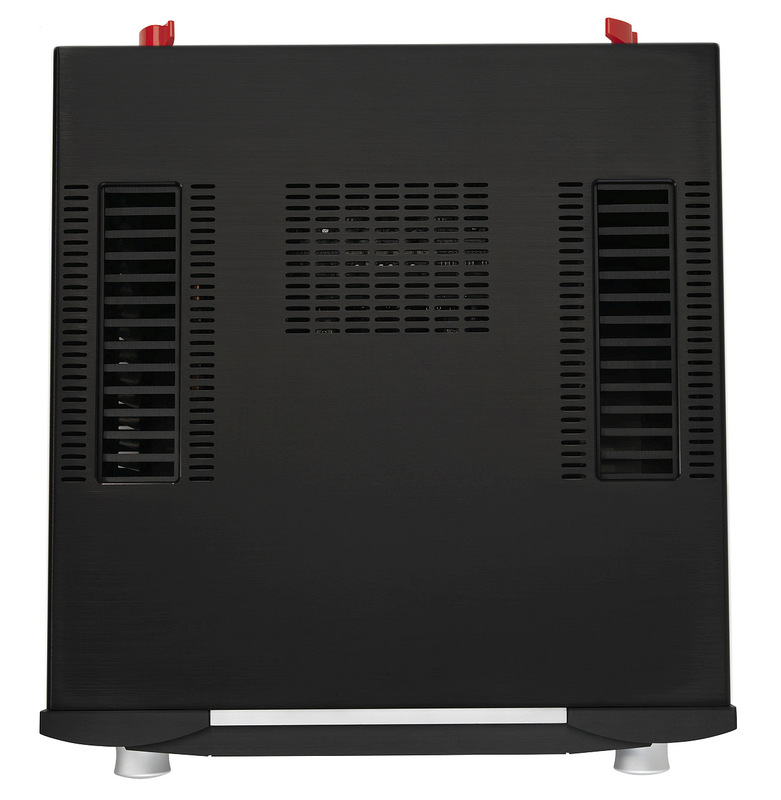 Its high-current, fully differential (balanced) Class AB power amplifier section utilizes an oversized 900VA custom toroidal transformer with individual secondary windings for the left and right channels. 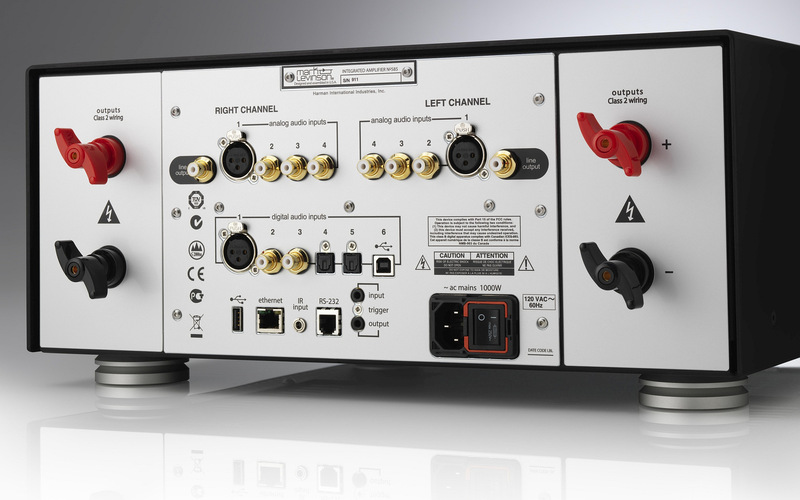 Separate left- and right-channel regulated linear power supplies are used for all the analog circuitry, to maintain maximum signal purity. 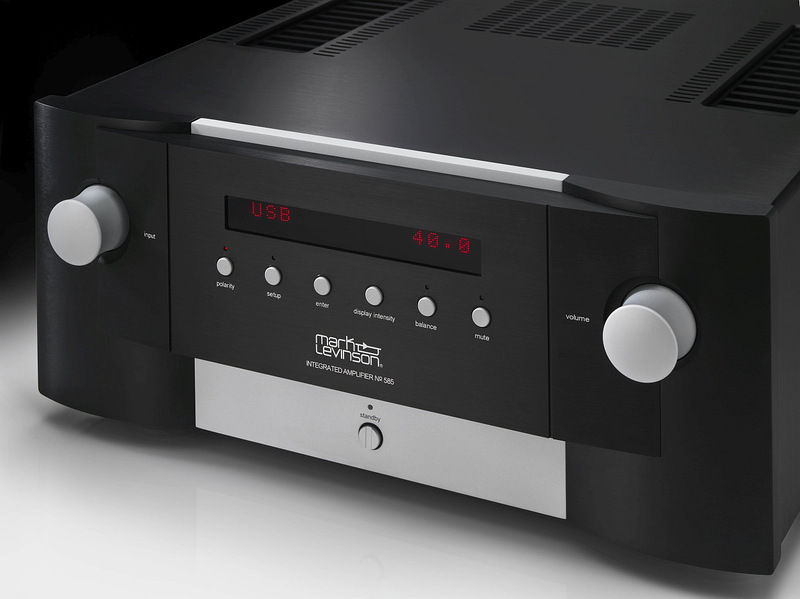 Each amplifier channel employs 12 output transistors for a power rating of 200 watts per channel into 8 ohms. At the heart of the No. 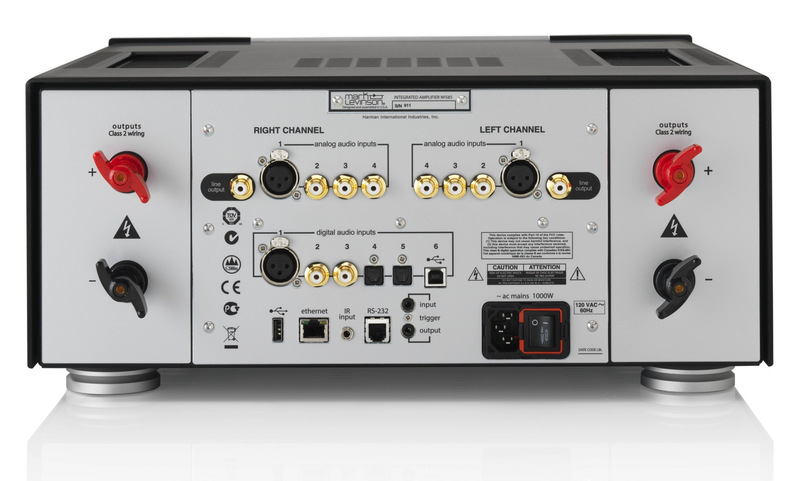 585’s digital audio processing stage is an ESS Sabre 32-bit D/A converter with proprietary jitter elimination and fully balanced, discrete I/V (current-to-voltage) circuitry. The Cmedia USB audio processor is capable of asynchronous data transfer of high-resolution DSD and PCM files at up to 192kHz/32-bit resolution. For lower-resolution audio formats, HARMAN’s Clari-Fi signal processing reconstructs information and bandwidth that is lost in compressed file formats restoring higher-fidelity sound. In contrast to competitor offerings, Clari-Fi™ does not blindly add equalization, bass boost, or other effects that alter the intended listening experience. Like every Mark Levinson component, the No 585 integrated amplifier is built without compromise to the highest standards, using a heavy-gauge chassis and card-cage architecture to isolate critical low-level analog and digital circuitry, and featuring audiophile-grade internal components and premium rear-panel connectors. 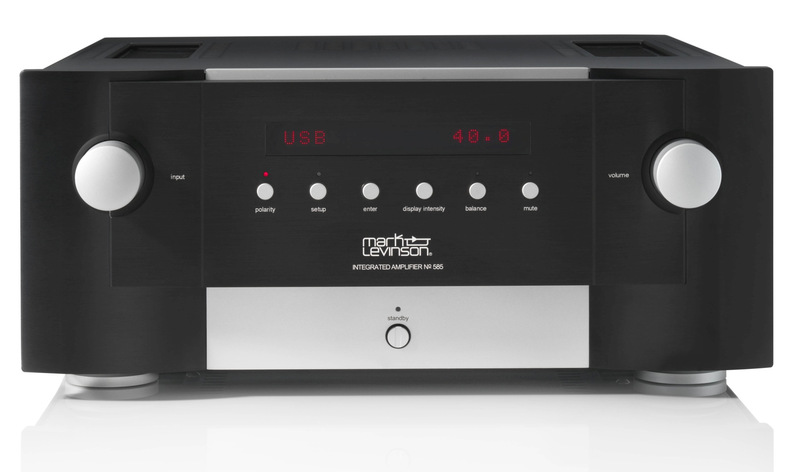 Though sophisticated in its capabilities, the Mark Levinson No 585 is simplicity itself to operate via its dual front-panel knobs and six function buttons or using its included remote control. The No 585 is as stunning in appearance as it is in performance – its next-generation industrial design and superior casework blends iconic Mark Levinson historical elements with a crisp modern look. The No 585’s substantial extruded and machined aluminum front panel has a two-tone brushed black and textured silver finish, accented by the company’s iconic red panel display and LED indicators. 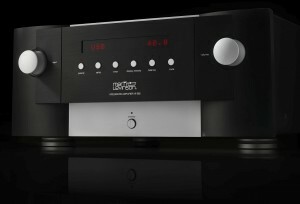 The Mark Levinson No 585 Integrated Amplifier will be available in September 2014 at a suggested retail price of $12,000. Last but not least, … Many kind thanks to Magdalena, who has provided me with the support and materials necessary to prepare this information about this outstanding piece of electronics for you.